A range of tissue homogenizing setups are available depending upon your desired result and processing requirements. Contact us today for a tissue homogenizer quote. Review all of our PRO Tissue Homogenizer models. Whether you are looking for a fibrous tissue homogenizer or a soft tissue homogenizer the key is to find a tissue homogenizer that is precision designed for consistent results. When our PRO Homogenizers are equipped with one of our PRO Generator Probes or our Multi-Gen 7XL Multi-Sample Stainless Steel Probes they are capable of efficiently and effectively homogenizing tissue samples in tubes from .5ml up to multi-liters. The precision design of our PRO generator probes is unparalleled in the industry and allows for consistent homogenizing, meaning you get the results you need each and every time. All PRO Homogenizers offer variable speed control. Variable speed allows for maximum homogenization or if necessary, for the preservation of organelles, large molecules, and viruses. Click here to begin choosing a tissue homogenizer package. 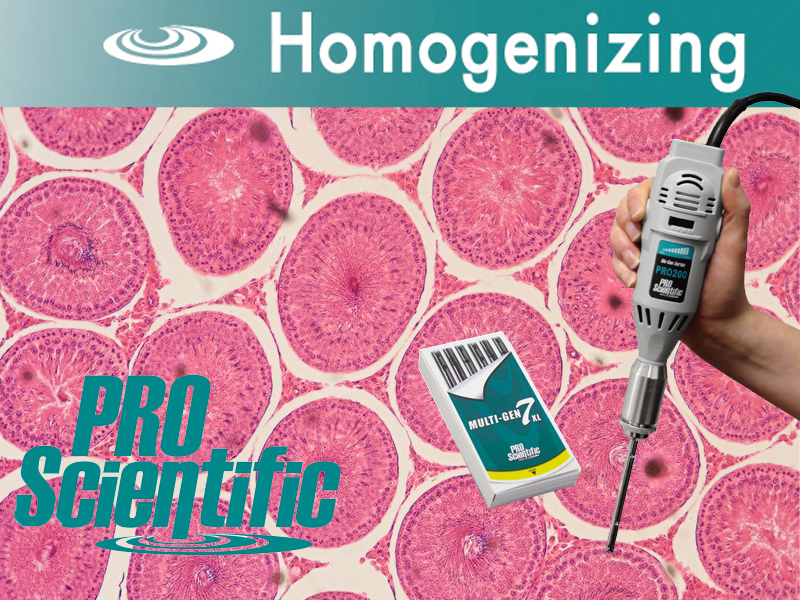 Using a PRO Homogenizer for tissue homogenizing is easy and convenient - there are no special tubes or beads to buy. Tissue homogenizing with a PRO Homogenizer is easy! Our PRO Generator Probes and our Multi-Gen 7XL Multi-Sample Stainless Steel Probes are compatible with a wide range of standard tube and beakers so there is no need to buy any special beads or vessels, like when you are bead-beating. We have PRO Generator Probes to process in tubes as small as .5ml and up to multi-liter processing and our Multi-Gen 7XL Multi-Sample Stainless Steel Probes easily process in tubes from 1.5ml-50ml. PRO Scientific offer convenient Homogenizing Package Kits which include everything you need to begin homogenizing. PRO Homogenizer packages are easy to select based on the number of samples you are processing and the tube(s) you are processing in. When you are homogenizing a lot of samples at a time or need to avoid cross-contamination between your tissue samples, a PRO Homogenizer equipped with our Multi-Gen 7XL Multi-Sample Stainless Steel Probes is ideal. The 12-Pack design reduces cross-contamination risk, by allowing you to process each sample with a clean generator and eliminate cleaning between samples. But don’t just take our word for it. See why our customers think PRO Homogenizers are ideal tissue homogenizers. These are product reviews collected by independent third party, SelectScience.